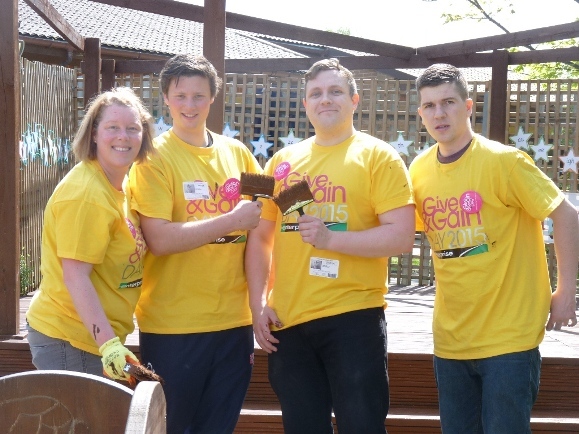 More than 200 volunteers from 15 top West Yorkshire companies dug deep to give the grounds of two Leeds schools a makeover as part of national Give and Gain Day 2015 run by the charity Business in the Community (BITC). The companies gave their staff time off to volunteer for the UK’s biggest day of employee volunteering. Around 150 volunteers from Yorkshire Bank, DWF, DAC Beachcroft LLP, Lloyds Banking Group, DLA Piper, Morgan Sindall, Rotork and Valad Europe were at Allerton Church of England Primary School to revamp a former vegetable garden and spruce up paintwork around the whole site. At Harehills Primary School a 60-strong team of employee volunteers from EMIS, TD Direct Investing, Emsleys Solicitors, Enterprise Rent-a-Car and Wrigleys Solicitors gave the front of the school a facelift, including the installation of raised wooden beds for herbs and vegetables. As the West Yorkshire employee volunteers stepped up to help the project, new research published by the Prince of Wales’ charity BITC to mark Give & Gain Day , suggests that 64 per cent of workers in the North of England do not know, or are not aware, of their employer’s employee volunteering policy, compared to the national figure of 76 per cent. The Ipsos MORI survey of 2,174 online adults aged 18+ in Great Britain assessed views on business behaviour. Among workers in the North, it found around only 4 per cent reporting that they have used their employer’s volunteering scheme. A further 4 per cent are aware of their employer’s volunteering scheme, but their primary reason for not using it is a lack of time. Liz Needleman, area director of BITC England East, said: “Skilled volunteers are a lifeline for community organisations hit by cuts, yet as our research shows there is more to be done to embed volunteering as part of everyday business. Jacqui Atkinson, community support manger from Yorkshire bank who took part in the activities, said: “Yorkshire Bank was delighted to support Give and Gain Day. We had 117 employees giving up their time to help communities across Leeds, Sheffield, Nottingham, Bradford as well as further afield in Manchester, Reading, Birmingham and London. “Our eight teams were involved in a wide range of community support from sprucing up children’s play areas and improving pathway access to creating a science garden and supporting a military museum. The West Yorkshire volunteers were among more than 15,500 from UK businesses who headed out to help 144 local communities on May 15 for the world’s only day of employee volunteering, organised annually by BITC. The total value of staff time invested in the day’s volunteering throughout the UK is estimated at more than £1.9million.